Take a drive deep into West Texas, through the Martian landscape of the Chihuahuan Desert, and you’ll arrive at an oasis—not of water, but of art. The town of Marfa may be in the middle of nowhere, but to the Texans who call it home, that’s exactly the point. 9:00 a.m. I awoke to the sound of wind beating the side of my teepee at El Cosmico, a creative lodging concept comprised of quirky abodes such as remodeled vintage trailers and safari tents. I stepped into the dry desert air, and instantly felt connected to the land, people, and vibe of Marfa. 9:30 a.m. I grabbed an outdoor seat at Squeeze Marfa, a Swiss café tucked in the back of a building just off the main strip. I decided on a healthy (and delicious) bowl of “Swiss Birchermüesli,” consisting of oats, yogurt, and fruit. This way I didn’t feel guilty for indulging in breakfast dessert—import-ed Swiss chocolates. 10:15 a.m. I set off on foot to the 1880s Presidio County Courthouse. The only thing more impressive than the exterior was the view from the top as the town of Marfa and distant mountain ranges unfurled before my eyes. popped into Marfa Book Company, the town’s main hang-out; Hotel Paisano, with its museum dedicated to the 1956 film Giant, which was filmed in Marfa; and finally the home of Marfa Brand, where I picked up some handmade soaps. with residents and visitors from all over the world. all started, the Chinati Foundation. I hopped on a guided tour and learned how artist and visionary Donald Judd moved here in the 1970s to create art and began inviting artist friends to Marfa. Art begat more art, and before long Marfa had a thriving community of contemporary artists creating amazing and mind-blowing works in the middle of the desert. 4:00 p.m. 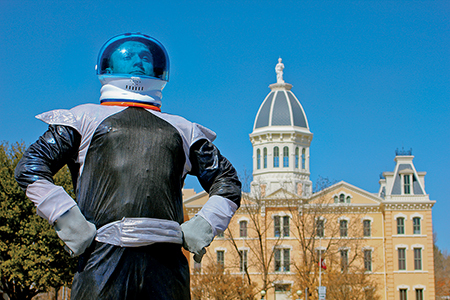 Inspired to contribute to the art scene, I donned an astronaut suit and became a living art piece in front of the courthouse—part homage to my otherworldly day trip and part commentary on intergalactic exploration and its effect on small-town commerce … (yeah, I don’t get it, either). 4:30 p.m. I decided to actually leave Earth with a ride from Marfa Gliders. The landscape and wind currents of Marfa make it one of the best places in the world to soar. It was a little nerve-racking being thousands of feet high without an engine, but experienced pilot and owner Burt Compton made it easy to ride the currents of air straight up and into the wide-open Texas sky. 8:00 p.m. As the starlight shone in the sky, I decided to try and spot the famous Marfa Lights at the viewing area nine miles east of town. If you’re lucky, the lights will appear on the hori-zon just as they have since long before the first recorded sighting in the 1880s. As the desert air grew cold, a small light appeared and danced in the distance. It was definitely strange, but after everything that I’d seen in Marfa, this mysterious orb fit in perfectly. So, whether you follow my footsteps or forge your own path, I hope to see you on the road.